As classic sun protection devices, horizontal blinds have many characteristics: they offer shade, control the incidence of light, permit views of the outside, guarantee privacy protection, have delicate hardware and give the room a matter-of-fact, light mood. In particular at PC workstations, glare-free illumination can be created that positively affects the motivation and performance of people. 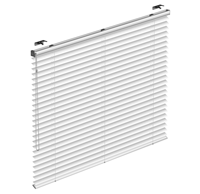 An outstanding model that sets innovative standards is the TwinLine horizontal blind. Freely movable from the top or bottom, the hanging can be placed in any desired position in the window and, in addition, the tilting angle of the slats can be individually adjusted. It is installed in the glazing bead so that the function of side-hung and bottom-hung windows remains unrestricted. With high-quality materials, new feels, current colours and sophisticated hardware, horizontal blinds combine design, form and function for the highest requirements in day-to-day working. 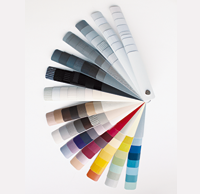 Over 114 colour combinations in current interior trends and the most diverse surface textures such as strongly structured, velvety, smooth or high gloss provide for endless creative freedom. Perforated slats provide for a special effect: they allow views of the outside even when the hanging is closed.